Ownership / Access: It now houses the Naval Academy of the Finnish Navy. Notes: Suomenlinna (Finnish) or Sveaborg (Swedish), until 1918 Viapori (Finnish), is an inhabited sea fortress built on six islands (Kustaanmiekka, Susisaari, Iso-Mustasaari, Pikku-Mustasaari, Lansi-Mustasaari and Langoren) and which now forms part of the city of Helsinki, the capital of Finland. Suomenlinna is a UNESCO World Heritage site and popular with tourists and locals, who enjoy it as a picturesque picnic site. Originally named Sveaborg (Fortress of Svea), or Viapori as called by Finnish-speaking Finns, it was renamed Suomenlinna (Castle of Finland) in 1918 for patriotic and nationalistic reasons, though it is sometimes known by its original name. The Swedish crown commenced the construction of the fortress in 1748 as protection against Russian expansionism. The general responsibility for the fortification work was given to Augustin Ehrensvard. The original plan of the bastion fortress was strongly influenced by the ideas of Vauban, the foremost military engineer of the time, and the principles of star fort style of fortification, albeit adapted to a group of rocky islands. In addition to the island fortress itself, seafacing fortifications on the mainland would ensure that an enemy would not acquire a beach-head from which to stage attacks. The plan was also to stock munitions for the whole Finnish contingent of the Swedish Army and Royal Swedish Navy there. In the Finnish War the fortress surrendered to Russia on May 3, 1808, paving the way for the occupation of Finland by Russian forces in 1809. 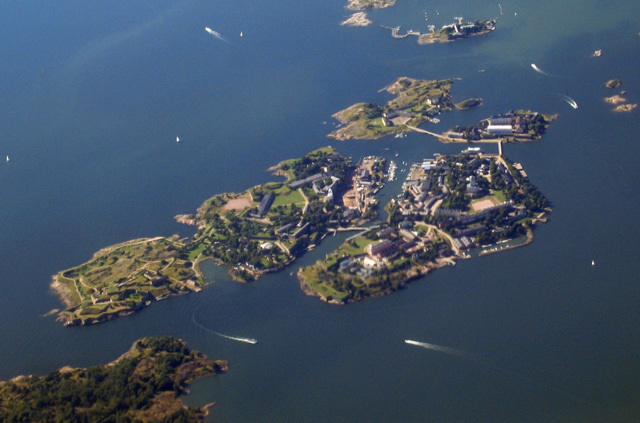 No longer very practical as a military base, Suomenlinna was turned over to civilian administration in 1973. An independent government department (the Governing Body of Suomenlinna) was formed to administer the unique complex. At the time there was some debate over its Finnish name, with some suggesting that the old name Viapori be restored, but the newer name was retained. The presence of the military on the islands has been drastically scaled down in recent decades. The Suomenlinna garrison houses the Naval Academy (Finnish: Merisotakoulu) of the Finnish Navy. Suomenlinna still flies the war flag, or the swallow-tailed state flag of Finland.Suomenlinna is now one of the most popular tourist attractions in Helsinki as well as a popular picnicking spot for the city's inhabitants. On a sunny summer day the islands, and in particular the ferries, can get quite crowded. In 2009, a record 713,000 people visited Suomenlinna, most between May and September. A number of museums exist on the island, as well as the last surviving Finnish submarine, Vesikko.Suomenlinna has always been much more than just a part of Helsinki - it is a town within the town. There are about 900 permanent inhabitants on the islands, and 350 people work there year round. This is one of the features that makes Suomenlinna unique: the fortress is not simply a museum but a living community. There is a minimum-security penal labor colony (Finnish: tyosiirtola) in Suomenlinna, whose inmates work on the maintenance and reconstruction of the fortifications. Only volunteer inmates who pledge non-use of controlled substances are accepted to the labour colony. For the general public, Suomenlinna is served by ferries all year, and a service tunnel supplying heating, water and electricity was built in 1982. From the beginning of the 1990s, the tunnel was modified so that it can also be used for emergency transport. Suomenlinna has been known as an avant-garde location for culture. In the mid-1980s the Nordic Arts Centre was established on the island. Several buildings have been converted into artists' studios, which are let by the administration at reasonable rates. During the summer there is an art school for children. The performances of the Suomenlinna summer theatre regularly draw full houses. Between 2 and 6 September 2015, the Finnish postal service ran a test of the use of drones to deliver parcels between Helsinki and Suomenlinna. The parcels were limited to 3 kg (7 lb) or less, and flights were under the control of a pilot.